This article was first published in the London Cyclist, the magazine of the London Cycling Campaign. The Netherlands is hard to beat as a destination for touring holidays, with many of us heading up the coast towards Amsterdam. For Croydon residents, you may wish to head further west to the modern Rhine city of Arnhem and its stunning national park, the Veluwe. Croydon Bicycle Theatre was formed semi-accidentally. Returning to work as a teacher after maternity leave I found that I had far less time to cycle and certainly no opportunities to go to the theatre. So Seeing the Omnibus Theatre (and Lambeth Cyclists supported) production, ‘A Midsummer Cycle Ride’, was a light bulb moment. Here was an example of a family ride on London roads that put cycling at the centre of a theatrical performance. What if we could do this for families in my not-very-cycle-friendly hometown of Croydon? Luckily, I am fortunate enough to have a theatre practitioner for a best friend and that she was willing to give this vision a shot. And so Croydon Bicycle Theatre was born, along with a decision to ride to Croydon’s twin town of Arnhem in the Netherlands. Arnhem and Croydon’s twinning history goes back to 1946, when both towns were only just starting to recover from the extensive damage they’d suffered during the war. 1944’s Battle of Arnhem (immortalised in Richard Attenborough’s 1977 film A Bridge Too Far) was one of the least successful operations of WWII, despite being the largest airborne operation in history. Croydon played a key role in the Battle of Britain, with both its Airport in Waddon and the Aerodrome in Kenley involved. Yet Croydon’s modern image was shaped during the Post-War years with civic leaders aiming to build civic pride through a motor-centric town centre, with car parks, flyovers and underpasses all being built in rapid succession. Unfortunately, the vision of 60 years ago, means Croydon is one of the least safe London borough’s for cyclists and subsequently has one of the lowest levels of commuter cycling in the capital. Arnhem, on the other hand, was a host town for 2017’s Velo-City conference. To us, this seemed an obvious indication of both how safe cycling must be there and how popular. And so the #tandem2Arnhem project was born, with the belief that our twin town would provide the inspiration for how the Croydon of the future could look. 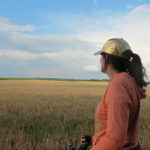 In 2011 Vanessa Hammick, my Croydon Bicycle Theatre co-founder, walked from Wales to London, collecting stories which became the backbone of a piece, NowHere, later performed at the Edinburgh Free Festival. Similarly, our trip to Arnhem wasn’t just about having a nice time or checking out some high-quality Dutch infrastructure, but searching for stories that could be transformed into a theatrical narrative and the ‘Vrienden op de Fiets’ network seemed the best place to start our search. 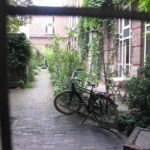 The network was established in Arnhem in 1984 and allows walkers and cyclists to become ‘vrienden’ (friends), lodging in other members’ houses for a reasonable cost. The best thing is, you never know exactly quite who you will end up meeting or what stories you will hear. But we weren’t sure this would be enough. We needed to attract attention, to get the conversational ball rolling so to speak. Matching outfits were needed. Purple t-shirts and green shorts (tipping our caps to our suffragette foremothers) with gold accessories adding a bit of Croydon bling to the ensemble. And doing the whole journey on a tandem seemed the best idea of all. 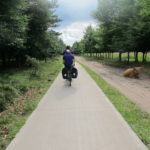 Our week’s tour took us from the Hook of Holland east to Utrecht, then through the town of Apeldoorn and into the Veluwe National Park before reaching Arnhem. The Rhine Cycleway and a Rhine riverboat took us back to Rotterdam before a final ride into a North Sea storm and our ferry home. Probably some of the trip’s most striking impressions barely even need mentioning; of course the riding was great! But others evolved with time, as impressions gradually built over the days, through the different landscapes and as we met our different hosts. In Arnhem, we were extremely fortunate to be able to spend a day with Jan, from the local Fietserbond chapter. The Fietserbond, are the Dutch Cyclists’ Union, campaigning for safer cycling conditions in the Netherlands. His city tour included the Airborne Museum, a solar-powered Rhine riverboat, a cool community park and even his house for a cup of tea (we needed it, we were soaked. The Netherlands may be flat, but it is wet.). As he guided us around, he pointed out bits of infrastructure that the Fietserbond in Arnhem had campaigned for and saw as successes, as well as the bits that he felt were less successful. During one of the day’s many wet-weather coffee stops he told us about the chapter’s greatest campaigning victory. He described a ring road in the town centre, where three lanes of traffic loop around a small park. It was one of the city’s most polluted spots and with one of the worst records for road safety, with drivers cutting across and changing lane too frequently, resulting in frequent collisions.